This is the new Mercedes-Benz C-Class Coupe which goes on sale in December. It should be priced from around £30,000, although that’s not yet been confirmed by Mercedes-Benz yet. Aimed squarely at the BMW 4 Series and Audi A5, it looks very pretty and given it uses the dashboard of today’s C-Class saloon virtually unchanged, it has one of the classiest interiors in the business. With a longer wheelbase than the C-Class Coupe it replaces, it boasts more shoulder room, head room and legroom in all four seats, while the bonnet is longer and the body wider, giving it a more aggressive look. Sitting on lower suspension than the C-Class Saloon (by 15mm), the Coupe has adaptive damping as standard, which firms up in Sport mode. And as usual in a Mercedes-Benz these days, air suspension is optional, offering five-way adaptive damping. Either way, the company claims that it has adjusted the suspension fundamentally to make the car more dynamic than the saloon, but without affecting ride quality. Standard equipment and full specification haven’t been confirmed yet, but we do know there will be an AMG Line version and most likely an entry-level SE. The AMG Line includes a body kit, bigger 18-inch alloy wheels (17-inch are standard) and a multi-function sports steering wheel. All cars will come with climate control, internet access via the COMAND infotainment system, voice control and Mercedes-Benz’s Artico fake leather for the seats. Safety kit includes Attention Assist drowsiness detection, radar cruise control, high-speed braking assist, low speed automatic braking, and self-parking. It’s not clear which of this is standard, as yet. The engine lineup comprises, at first at least, four petrol and two diesel units, with the petrol lot starting at a 1.6-litre C 180 with 156PS and ending with the 245PS C 300 2.0-litre unit. In the middle, the C 200 and C 250 have 184PS and 211PS respectively. 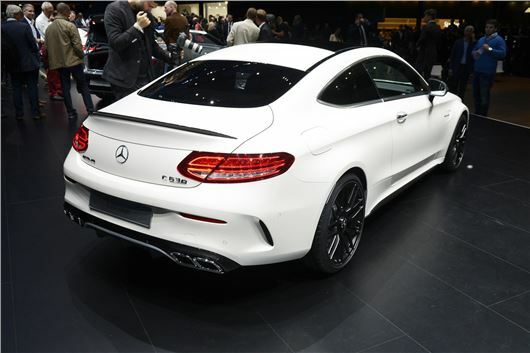 They will be joined by a BMW M4-rivaling C 63 AMG high-performance version, pictured here. The two diesels are both 2.1-litre engines, one with 170PS and another with 204PS, badged 220 CDI and 250 CDI as per their four-door counterparts.